When you consider how long you spend on your feet, playing a round of golf, you’ll appreciate the importance of good footwear. There are plenty of golfers out there who spend a minute or two trying on shoes, walking around the pro/golf shop, mimicking a swing or two, and then handing over the cash. And sometimes it’s up around the €120 mark, so you think folks would take more care when buying a shoe that is going to take one hell of a beating on the golf course. At Ballybunion, Ronan played the last hole of the night (our 27th) in bare feet because the back of his heel was rubbed raw by a pair of old shoes that had worn through at the heel. That’s how much of a beating you give your shoes. Am I offering advice about shoes? Not at all. I've digressed entitrely - but I will draw your attention to a more specific aspect of your footwear: orthotics. Or-what you might ask, or perhaps you know exactly what I’m talking about. 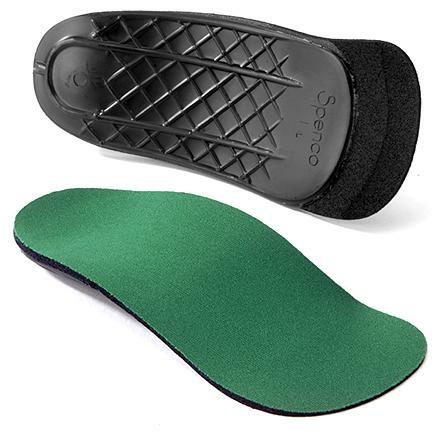 Essentially, orthotics fit inside your shoes and help your gait and the position of your feet relative to your body. They can be for flat feet, high arches or other foot ailments; they can be for knee and back pain too, because the pressure put on your back and knee by a poor footstep can be immense. Remember Olazabal’s foot problems? He had them for several years before they realised it was a back problem manifesting itself in his feet. And then he won the Masters. I visited a chiropodist today who specialises in orthotics (I’ve used them for 15 years), and after walking barefoot across a special mat with hundreds of sensors he pulled up the graphics on the PC screen and showed me how I walked. In a comparison that many golfers will be familiar with (namely, when you’re videoed during a lesson and then shown your swing compared with Tiger Woods – is there anything more depressing! ), I got to see the progress of my footstep compared with a “normal” footstep. The two looked like they came from different species. You’re supposed to walk on every part of your foot, from heel through to toe, yet I land on my heel, miss out the centre, progress to the front foot and then completely ignore my toes. It made me feel like an uncoordinated ape! But it got worse. When you put your foot down, your heel is the only part of your foot striking the ground for the first 20% of your footfall. That’s the “normal” footfall anyway. My right heel comes in at 46%; my left at 57% - meaning my balance is somewhat askew. I could go on with the figures, but I feel so abnormal at this point that I’d chop off my feet if I did. I got measured for new orthotics and that was that, but walking down the street afterwards was an entertaining experience as I tried to walk like a “normal” person and ended up doing a Charlie Chaplin. So, if you have back, knee or ankle pain, or even tight shoulders, it may be your body’s way of telling you that you’re not walking as well as you should. Orthotics could be the answer.